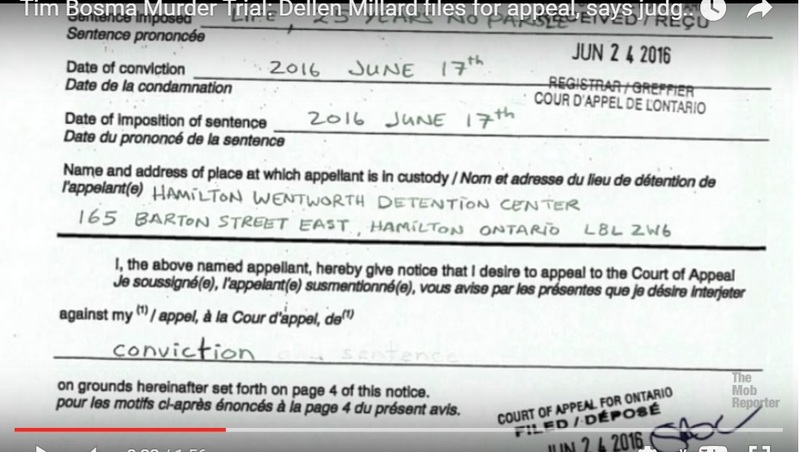 Dellen Millard’s hand-written notice from jail, seeking an appeal of his conviction for first-degree murder in the killing of Ancaster, Ontario father Tim Bosma. Dellen Millard and Mark Smich, convicted of first-degree murder in the high-profile killing of Tim Bosma, complain their marathon trial was unfair in handwritten notices from jail that seek an appeal of their convictions. Millard’s notice of appeal, befitting the wealthy and spoiled heir of a struggling aviation dynasty, is lengthy, formal and regimented. The notice by Smich, an unemployed drug dealer and aspiring rap artist, is just two simple sentences. 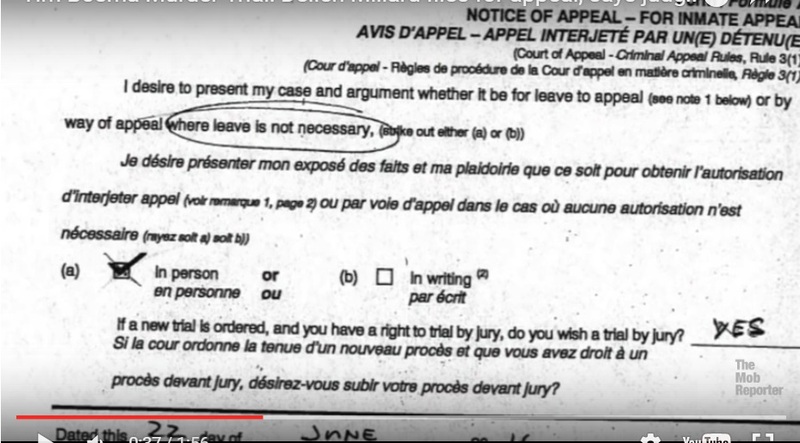 Millard and Smich both request to argue their appeals at the Court of Appeal for Ontario in person and, if granted a new trial, request another jury trial, instead of trial before a judge alone. 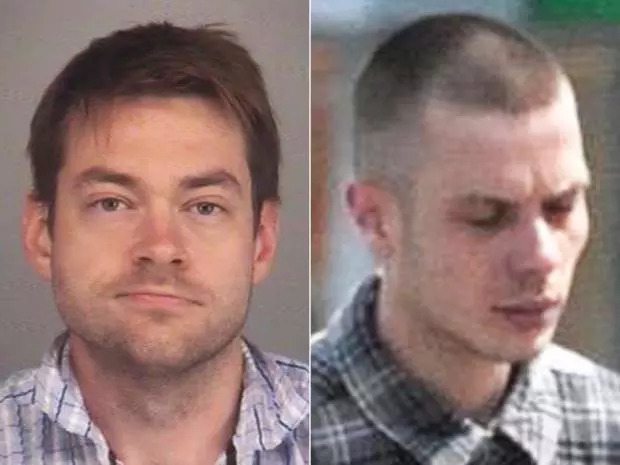 Dellen Millard, left, and Mark Smich were both convicted of first-degree murder in the death of Tim Bosma. Millard and Smich were each found guilty of first-degree murder by a jury on June 17 after a 16-week trial. They were sentenced to life in prison with no chance of parole for 25 years. Bosma’s disappearance on May 6, 2013, after leaving on a test drive of a pickup truck he was selling online, triggered a huge reaction not only in Hamilton but around the world. His burnt remains were later found in an incinerator on Millard’s farm. His truck was found hidden in a trailer in Millard’s mother’s driveway. Under the section of the appeal form that asks for his grounds of appeal, Millard hand wrote: “See attached — Appendix A.” He attached a typed and formatted list of 13 itemized points. It suggests Millard had legal assistance in its preparation. The reasons span the length of his proceedings — from pre-trial rulings to the judge’s final instructions to the jury. “The learned trial judge erred in failing to grant the appellant’s application to sever his trial from that of his co-accused,” is his first ground. 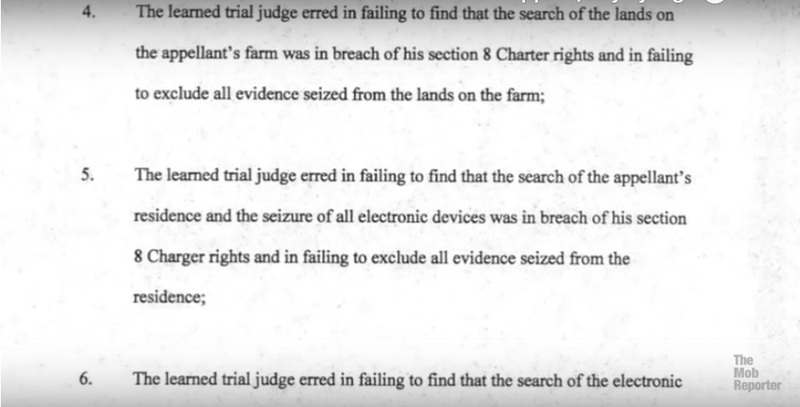 Millard says Goodman should have thrown out evidence seized by police during the search of Millard’s farm, which he claims breached his protection under the Charter of Rights against unreasonable search and seizure. The note from Mark Smich. Millard and Smich were each found guilty of first-degree murder by a jury on June 17 after a 16-week trial. It was on his farm, west of Hamilton, where police found the ominous incinerator — a giant animal crematorium with the words “The Eliminator” painted on its side. Inside, police found charred human remains. On the outside of the device was Bosma’s blood. He also objects to the use of evidence seized from his home in Toronto’s Etobicoke neighborhood, where computers were found. A forensic examination turned up searches for truck ads that led Millard and Smich to Bosma, as well as photos of guns, and text messages. Millard specifically objects to the incriminating string of text messages read by the jury that shows him negotiating to buy a Walther PPK handgun, which was identified at trial as the murder weapon. 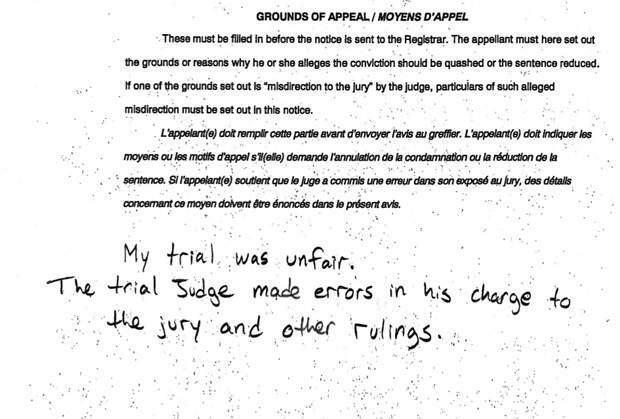 Further, Millard claims an error was made in not accepting his mid-trial mistrial application. A publication ban prevents reporting on the reasons behind the application. The closing address by Assistant Crown Attorney Tony Leitch is also one of Millard’s grounds for appeal. In an emotional end to his address, Leitch told jurors, “Don’t forget about Tim,” when they begin their deliberations on the men’s guilt. 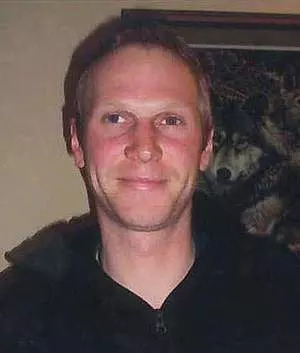 Tim Bosma’s disappearance on May 6, 2013, after leaving on a test drive of a pickup truck he was selling online, triggered a huge reaction not only in Hamilton but around the world. 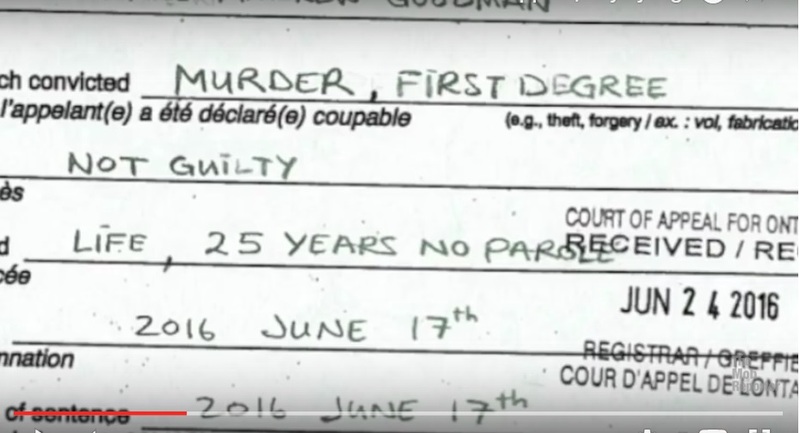 Goodman admonished the Crown after the jury left and, days later, in his instructions to the jury, Goodman told them to disregard the comment, but Millard claims the judge should have immediately corrected the record for the jury. Finally, Millard appeals on the ground that Goodman made a mistake in instructing the jury that “there was no evidence that the death of the deceased was an ‘accident’,” Millard writes. He complains this wrongly shifts the onus from the Crown proving a wrongful death to an expectation of the defence to prove an accidental one. 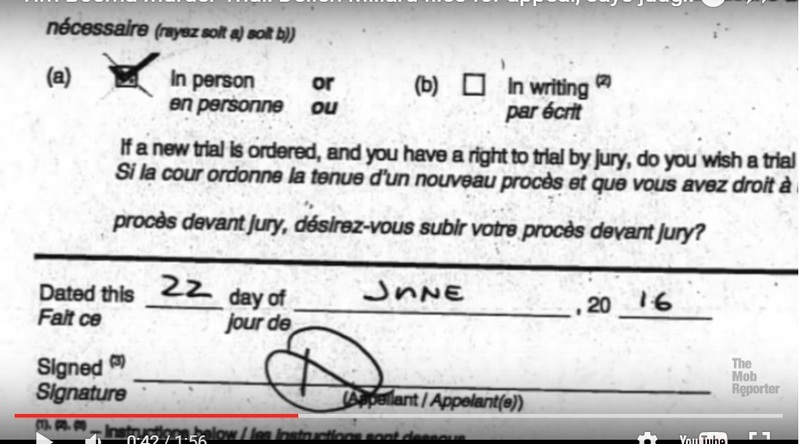 Millard’s appeal is dated and signed June 22 and was received by the Court of Appeal for Ontario on June 24. 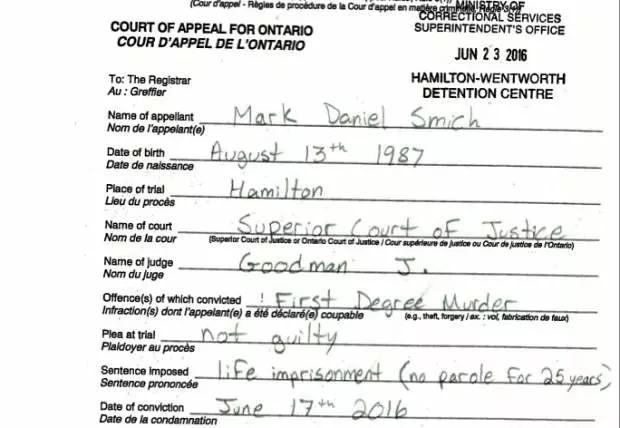 As Millard is currently detained at the Hamilton-Wentworth Detention Centre, the rules required him to deliver it to a senior jail official. Smich, on the other hand, kept his appeal to the bare minimal requirement. He likewise appeals his conviction and seeks an in-person hearing on the matter. Smich’s appeal is dated June 21, but was not received by the court until June 27. 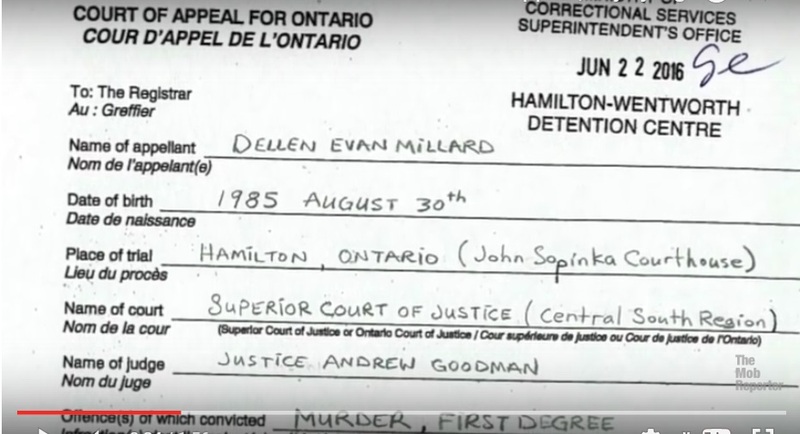 It is also noted as being written and filed from Hamilton Wentworth Detention Centre, but the National Post understands he has since been moved to an institution in Toronto. Thomas Dungey, who represented Smich at the 16-week trial, said his client was “very shocked” by the guilty verdict of first-degree murder against him. “He was more than surprised and shocked by it, that’s why he’s appealing,” Dungey said. “It is very basic,” he said of Smich’s filing but said Smich has strong grounds for appeal. Dungey, however, won’t be handling it. He wants his client to have a new set of eyes looking at the trial, the rulings and the evidence. Dungey, and co-counsel Jennifer Trehearne, will be representing Smich when Smich and Millard face another first-degree murder trial in the death of Laura Babcock, a former girlfriend of Millard’s. Millard is also charged with a third murder, that of Wayne Millard, his father. Both trials are scheduled for next year. It is likely the Babcock trial will be completed before the court of appeal deals with the Bosma trial appeals. Dungey said it could take two years to actually hear Millard’s and Smich’s appeals, which will be heard together. Ravin Pillay, lead counsel for Millard, declined to comment on the appeal. He declined to say whether he is handling Millard’s appeal and whether he expects to be representing Millard at the Babcock trial. “This was an incredibly difficult case for everyone involved. Our thoughts continue to be with Mr. Bosma’s family and friends,” said Heather Visser, spokeswoman for Ontario’s Ministry of the Attorney General. “The ministry would like to thank the jury for their service on this trial. This was a lengthy and difficult trial and we appreciate the time the jury members spent on this case away from their regular lives. We would also like to thank the Crown prosecutors for their hard work and all of the justice sector participants for the work that they do every day to ensure that our justice system operates fairly. “As both accused have filed an appeal in this matter that are before the courts, it would be inappropriate to comment further,” Visser said. A spokesman for the Bosma family declined to comment on the notices of appeal. 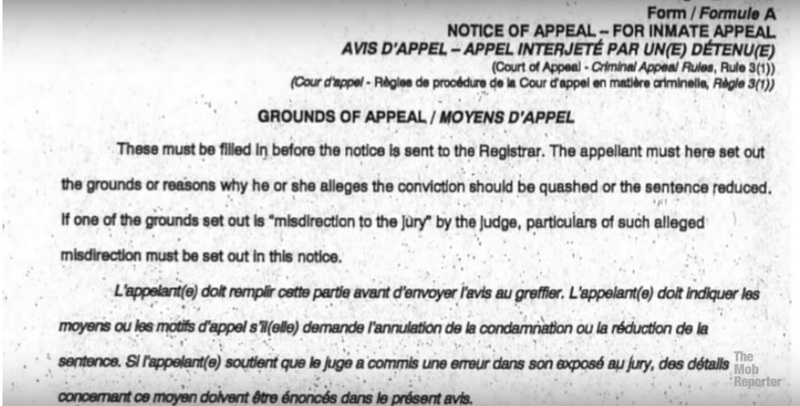 No matter how detestable the crime of the accused, this is an example of how difficult it is for accused persons to file a notice of appeal in Ontario. The Province of Ontario treats inmates appeals with scorn and uses a variety of subterfuges under Legal Aid Ontario to deny justice, to prevent "fair trials" and to prevent "fair" hearings of appeals which means most accused never even get a chance to get legal advice on the merits of an appeal. It is very rare for an Inmate Notice of Appeal to be published and it was published by way of the You Tube Video by "The Mob Reporter". YouTube Video by "The Mob Reporter"